What would you do for 100 days? Sometimes, I am most successful when I *think* the least. In April, I committed to completing an illustration every day and sharing it on social media for 100 days straight. Before I knew it, 100 days were over, and I am only now making time to reflect. This is me cheering myself on–the most valuable skill I gained from #the100dayproject. —if I did my drawing in the morning, a feeling of accomplishment followed me throughout the rest of the day, making everything else, even completely unrelated tasks, feel easier. —done is better than perfect. It really and truly is. Repeat that: done is better than perfect. 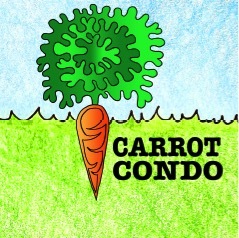 —but also, Carrot Condo followers gave me much support and frequently liked an illustration I’d found unsatisfying. I learned that just because I feel bad about something doesn’t mean it is bad. Set it aside for a day or two and then assess. Done is better than perfect. Done is better than perfect. Done is better than perfect. Thanks to this challenge, I now have 100 illustrations I would not have otherwise. The pressure of daily practice forced me to try new things and follow through whether I loved it or not. The challenge out-paced perfectionism. The cake my friend gave me to celebrate completing 100 days! You can see all 100 illustrations at: #100daysofcheer, and you can still comment to let me know what you think. You’ll certainly be seeing variations of some of these at craft shows this winter. More on that next month. Thank you for your interest in my work at Carrot Condo. Your support keeps me motivated!